Dispel a world of finite lies. Creating visual images in paint is radically different from writing, which although synthetic in composing, remains analytic in process. After all I have written, I realized most of the people I know do not read much anymore…and no one has more than a few seconds to be “literary.” Who wants to “text” an essay? On the other hand, an image takes a fraction of a second to apprehend. 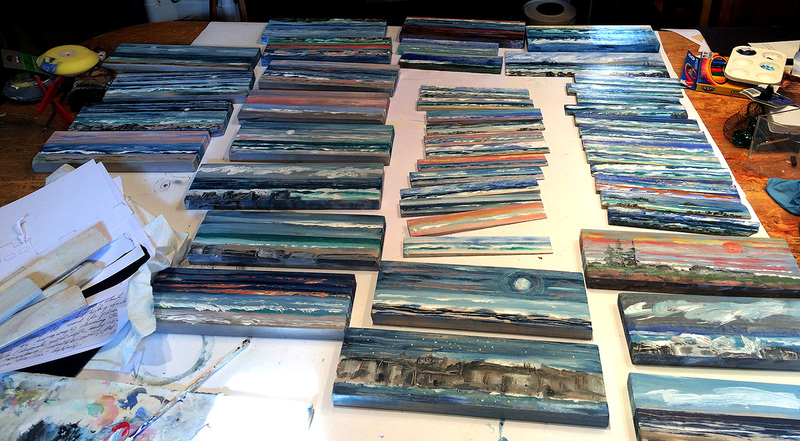 So I just finished painting over 60 seascapes on wooden shims from Home Depot, and 8 inch lengths of common board which I had made into faux driftwood. What occured, in less than five minutes for each one (just the painting of the scene), was an astonishing recollection of the many hours I spent over 4 months at Schoodic Point last summer and fall. And each was really different…morning, noon, night, sunlight, moonlight, fog, sunset…. a full spectrum of the many “faces” of the Schoodic Peninsula. It has been said that a picture is worth a thousand words. I just painted a book! Thus, I will be keeping my writing more brief in the future, as I continue painting on wood. The knotholes make wonderful moons, and the grain flows like the tidal currents. I am a captain of a ship that will take me to places I have been and will discover as I paint my way there! Love your board vignettes of seaside – like many of my memories not only of the Maine coast but of Port Townsend WA as well where I lived for a few years. The vignettes are like snapshots, fleeting memories of a specific afternoon or event – but aren’t words just that also? Something in us resonates with the words so that they evoke specific episodes in our own lives that enable us to connect to this poem/essay/etc in the same way that my emotional response to your paintings also evoke a specific mood, memory, feeling. It’s all our own experiences that find an echo in your works – and some folks are perhaps more visual than literary – but it all works primarily for the same reasons, don’t you think? Your little painting on wood, is just right here: small apartment, few blank walls, trained eyes, lonesome heart, waiting shelf, perfect gift.